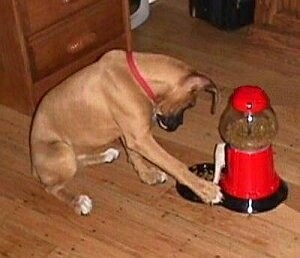 The Yuppy Puppy® Treat Machine is made from cherry red cast metal with a glass globe. 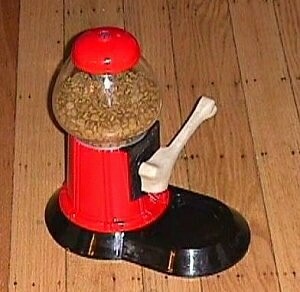 Watch your dog push the handle down to dispense treats or food. 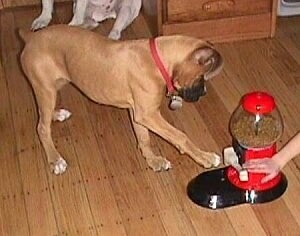 It vends most dry pet foods. Training instructions are included (if you really need them). It is 13" high. If you can teach your dog to shake hands, you can teach your dog to use the The Yuppy Puppy®. Hold your hand near the treat handle and tell your dog to give you his paw. Pull your hand away as soon as the dog starts to give you his paw, allowing the paw to fall onto the handle. 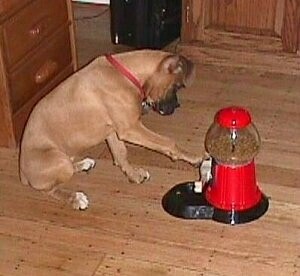 Your dog will soon learn that if he paws the handle he will get a tasty treat! Yummy! The The Yuppy Puppy® can be a very helpful tool to deter boredom. It is not only fun for your dog, but it is fun for you, too! 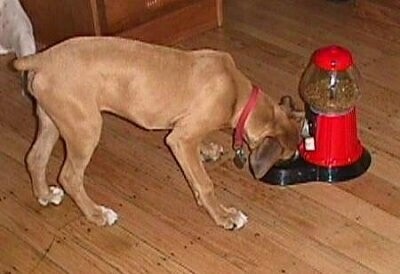 Leave the treat machine down for your dog while you go to work and give your dog something tasty to do while you are gone.